Failure to properly and completely stop the rod at the end of the cast leads to most of the poor casts that I see. It’s an issue that also afflicts casters of various degrees of proficiency. It is responsible for sweeping the rod too far forward (and therefore, down), which opens the loop and wastes energy. This is often a sign of overpowering the rod—too much force in the casting hand prevents the caster from stopping fast enough. This means the rod actually drifts forward after the cast, which produces waves in the line and, again, wastes energy. Worse, waves in the bottom of the loop mean that the loop no longer has the tension to continue unrolling. This slack in the “back” of the line is a major reason for pile-ups at the end of that final cast. An improper stop can also be a symptom of a mental state. The caster is trying to land the fly softly and so makes a “soft” cast. The rod sweeps through a long, slow stroke at the end of the cast, which results in the cast piling up partway to the target. Since the rod sweeps through a long arc it ends up throwing the energy of the cast down in front of the angler. 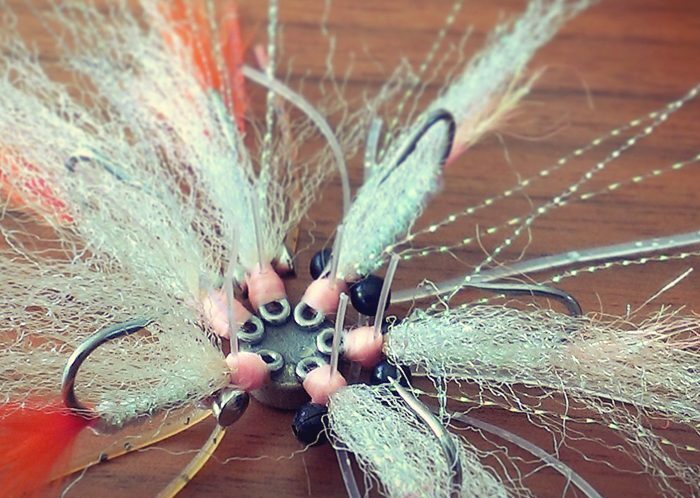 Slowing down the end of the cast—the stop—doesn’t make the fly land softly, quite the opposite. A sharp, crisp cast that creates a tight loop will land the fly much quieter, not to mention stand a much better chance of reaching the target. 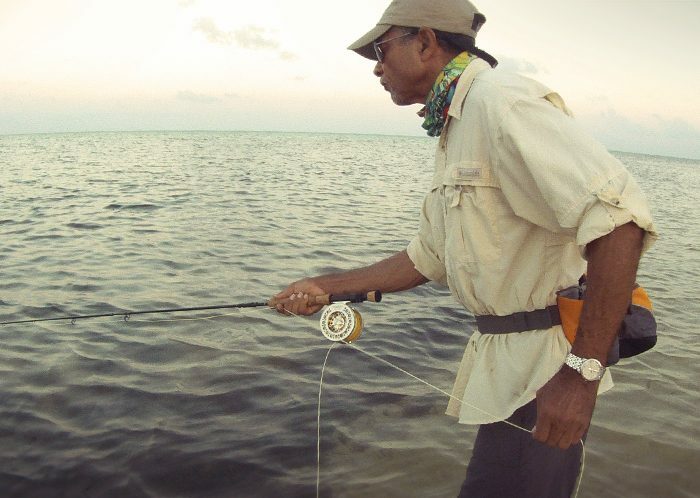 Once you get a handle on stopping the rod properly—keeping tension in the loop—the next step is to learn to really shoot line, and that means really learning to double haul. This is one of the biggest things an angler can do to improve their odds at bonefish, or any other spooky fish in skinny water. Instead of paying out the line in increments until they reach the target, anglers should be able to make fewer false casts and shoot more line on the last cast. Hauling on the line can increase the speed of the line, allowing it to travel farther before it starts to fall. Think of it this way, instead of only accelerating the line with your casting arm, you’re adding extra speed with your line hand by pulling the line toward the target. Not only does this speed up the line, but it bends the rod more, storing more energy to throw the line farther. While a good caster can certainly shoot line without double hauling, it will take much more precise timing and rod control. Adding a double haul takes the edge off, making it easier to make those longer casts or shoot line into the wind. Of course, the biggest reasons for shooting line is stealth. Fish in shallow water are instinctively wary of anything unusual overhead—memories, perhaps of being hunted by ospreys when they were young. 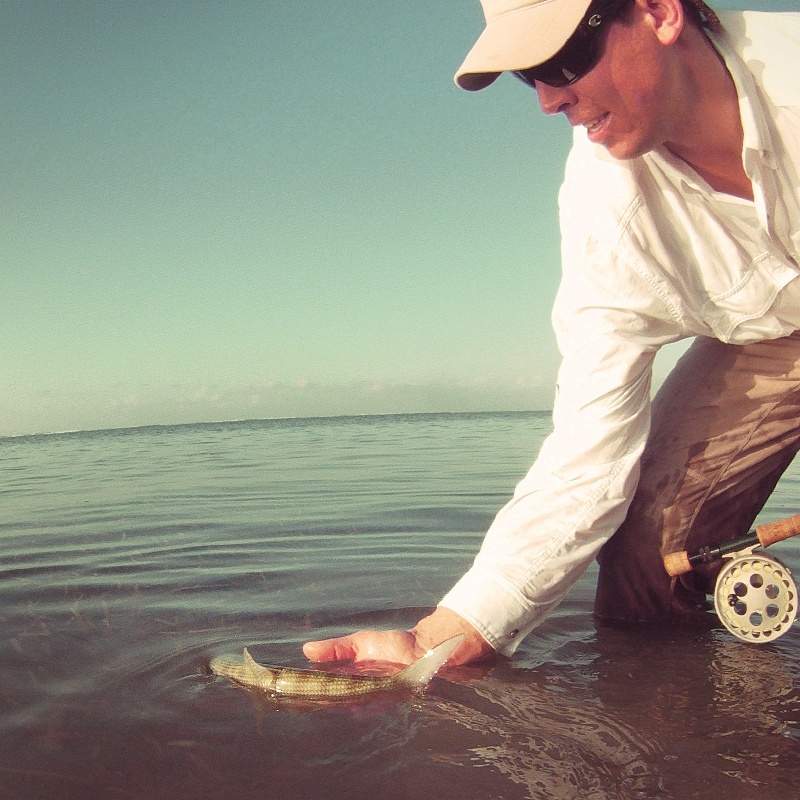 Shooting more line means fewer false casts, which not only give the fish fewer chances to spot the line, but shooting from farther away means that by the time the fly reaches the fish’s field of vision it will already be turning over and falling to the water. Instead of the bulky fly line turning over practically overhead, it is only the transparent leader and fly that might be momentarily visible. Being able to shoot more line also has an even greater advantage in regard to stealth. The farther the line travels the more momentum it loses. In other words, allowing the cast to naturally spend its energy means the fly is traveling relatively slowly when it finally turns over on the end of the leader. By contrast, stopping the line suddenly with the stripping hand (even if it’s on target) causes the fly to flip over with too much speed, splashing down instead of gently floating to the water. Fewer false casts also means less effort and fatigue throughout the day, so there’s a physical benefit as well. Finally, try to cast lower to the water. This means employing a side-arm stroke. Many of my first time bonefishers cast in a vertical position, having often learned on trout streams. Having the line flashing through the air at such a height is prone to spook fish. The lower the fly-line is to the water, the less chance the fish has of seeing it fly through the air. It will also fall from less of a height and land more quietly. The only drawback to this side-cast is it can lack accuracy if not performed correctly. Many casters use their stripping hand to stop the line on target. 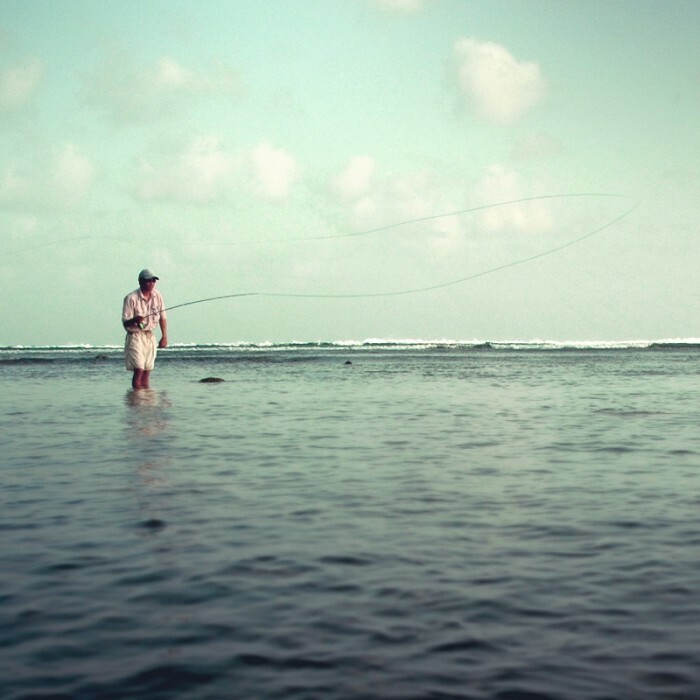 However, if they’re casting side-arm with a weighted fly and stop the line too suddenly the cast will hook – to the left if they’re right handed and to the right if they’re left handed. This not only costs accuracy, but also means the fly may be moving toward the fish with the first few strips, until the leader straightens. 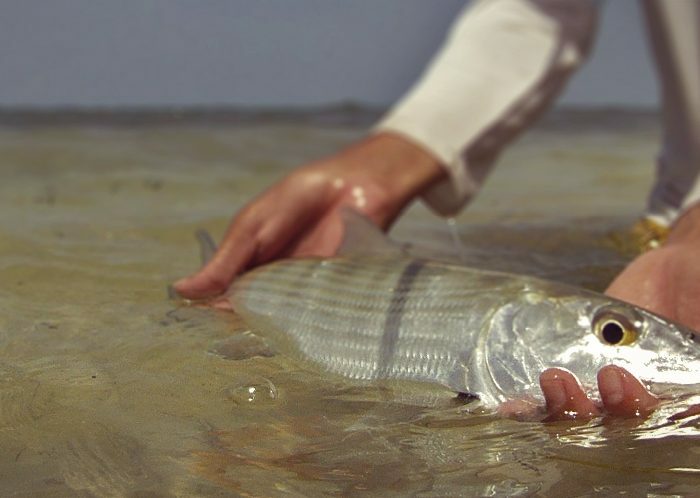 This is a sure way to spook bonefish. Shooting more line can alleviate this problem. What causes the line to hook is the suddenly stopping the line, which throws the weighted fly around a curve. However, if the line gradually slows to a halt, the leader will turn over straight. This can be accomplished by shooting more line and feathering it with your stripping hand. With a little practice you can shoot the fly directly to the target and have the leader turn over dead straight with the fly landing gently at the end. Try these simple tips before your next time your on the bow or wading the flats looking for tails flashing in the air. I guarantee your odds will go up.